Niangre Resort locates in 6 km from the center of Lhasa city. It is a folk custom garden with historical sites, cultural exhibition, living quarter and wood loft. Travels who are fond of traditional Tibetan culture and Tibetan village life can pay a visit to this beautiful place. Meanwhile, they can not only enjoy the natural views, but also can enjoy the folk dances and music. Besides, after the above activities, visitors can have various meal options. For example, the Tibetan dish, Chinese dish and new dishes that combines Tibetan-style and western-style. Or they may choose the group dinner of roasted sheep and grilled Tibetan pigs. Lhasa Niangre Resort locates in the northern Lhasa, 6km from the city center. It is pure folk attraction in Lhasa. 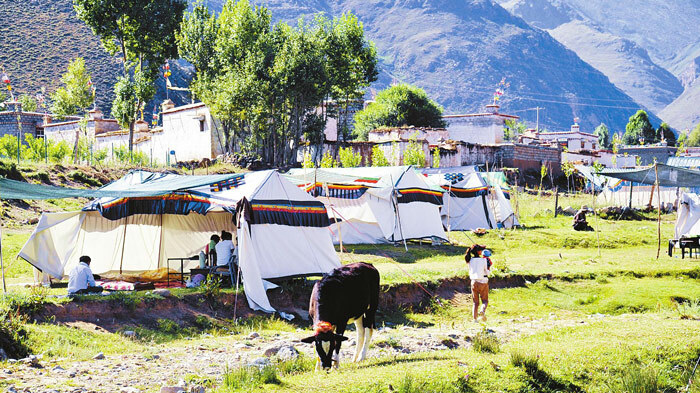 Tourists not only enjoy the folk custom garden, but also experience the typical Tibetan village life. So, if you want to explore the charm of traditional Tibetan culture, this is definitely a good place for you.